Singapore: PV Sindhu looked awfully out of form as she surrendered without a fight to former world champion Japan's Nozomi Okuhara in the women's singles semi-finals to draw curtains on India's campaign at the Singapore Open on Saturday. Sindhu, a Rio Olympics silver medallist, lost 7-21, 11-21 to World No 3 Okuhara in a lop-sided contest. Sindhu had won the last two times they played each other and overall enjoyed a slight 7-6 advantage in the head-to-head record with Okuhara. The duo had played an epic final at 2017 World Championship that had clocked 110 minutes and is considered one of the best women's singles match in the history of badminton. Since that marathon World Championship final, Sindhu and Okuhara have played each other six times and the Indian won four times. But Saturday, Sindhu looked completely out of sort as just 15 minutes into the match and she was crestfallen after meekly surrendering the first game following a heap of unforced errors, mainly at the net and sidelines. While in-form Okuhara showed great control, Sindhu looked low in confidence and lacked the patience to engage her rival in long rallies. 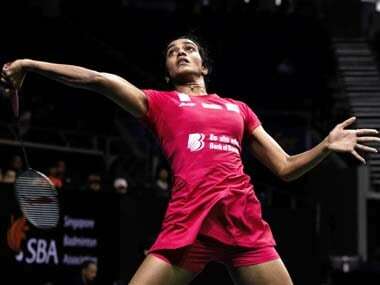 After the change of sides, Sindhu lagged 1-3 but she recovered to made it 4-4. Okuhara then changed the pace of the rallies and gathered six straight points, which included two precise lifts at the backline and also a prompt net return. The Japanese reached 11-5 at the interval. With Sindhu continuing to commit simple errors, which included missing the lines and finding the net too often, Okuhara dominated the proceedings, gathering points at will. Okuhara kept the pressure on Sindhu and eventually a round-the-head crosscourt return took her to 18-8. Four wide shots delayed the inevitable before Okuhara grabbed nine match points with another superb crosscourt smash. Another crosscourt return and she sealed her place in the final. Okuhara will face World No 1 Chinese Taipei's Tai Tzu Ying, who quite incredibly saved five match points to take the match against Akane Yamaguchi to the decider and then came up trumps. She won 15-21, 24-22, 21-19 in a 57-minute clash with Yamaguchi to enter the finals.